I was raised near Dorchester in Dorset (England) and very fortunate to be educated in state schools that had fully functioning ceramic departments run by inspirational teachers (Mr Welstead at Puddletown and Mrs Williams at Hardyes). 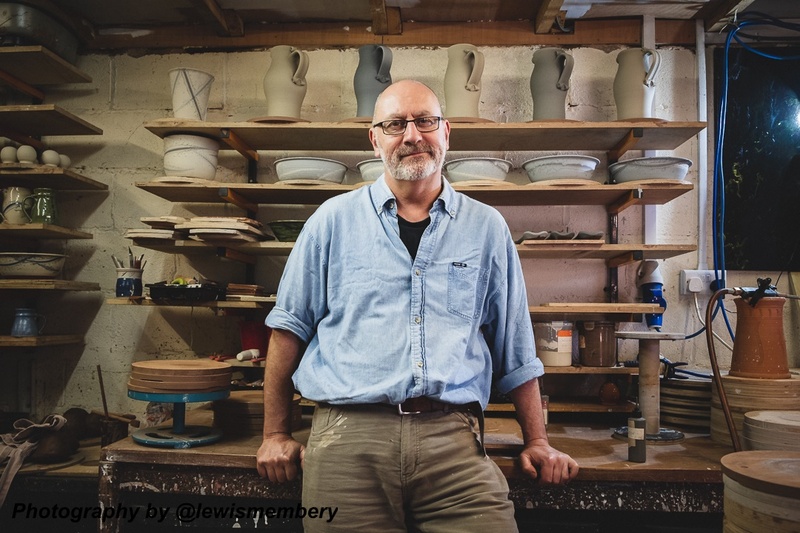 A potter I was not to be to start with though, but a degree in marine and earth sciences at Cardiff University continued to fuel my passion in pottery and when a little used garage presented itself in a house move the time was right to set up the first studio in Cardiff in 1996. In 2000 we then moved over the border and north to Worcester (with a bigger garage that wasn't being used, again....). My wife, Sarah, is a fused glass jewellery designer (www.sarahgreeningglass.co.uk) who sells online and has a stall at many of the same craft fairs as me. She offers 'taster' classes and is happy to discuss commissions of jewellery. Sarah can be contacted at sarah@sarahgreeningglass.co.uk Here you can see us outside our workshops on a bright, but chilly February afternoon - aiming to get back into the warmth of our own studios asap! My interests remain as they started, functional pottery that aims to make the eating or drinking experience a more enjoyable one, plus a few other products, usually stemming from commissions, that are particularly fun and rewarding to make.